To enable a small independent visual effects facility, Creative Bloke, with a versatile GPU that contains a combination of portability and performance to cater to their wide and varied portfolio of clients. Creative Bloke utilized the AMD Radeon Pro WX 9100 graphics card in the Apple recommended Sonnet eGFX Breakaway Box 650W, with Sonnet connected to an AMD FreeSync-enabled 4K display. From the UK’s National Trust to magazine publishers to manufacturers, digital content creator Mike Griggs has a wide and varied portfolio of clients for whom he creates 3D art, motion graphics and multimedia exhibits. A typical day might involve sampling birdsong near Virginia Woolf’s country estate or creating 3D animations for VR. To keep on top of these demands, Griggs wanted to take the full power of the GPU computing revolution on the road. “My work is never the same from one day to the next, and I need the power that GPU computing offers for CGI animation and portability — for client visits, working on the go, collating data from photo and video shoots and just exploring ideas while sitting on the sofa,” said Griggs, founder of Creative Bloke. However, until recently, Griggs found the combination of portability and performance led to many compromises instead of the optimal “laptop turned desktop workstation” he sought. Then Apple officially rolled out external GPU (eGPU) support for Thunderbolt 3 equipped Macs3, only recommending eGPU solutions powered by AMD graphics cards. An eGPU is a full-sized graphics card installed in an external enclosure with its own power supply that is then connected to the host PC or laptop via a Thunderbolt™ 3 USB Type-C interface. The latest macOS versions robustly integrate eGPU support for Radeon Pro graphics, providing a simple, plug-and-play experience for artists such as Griggs to easily and instantly boost the graphics capabilities of his Mac system. 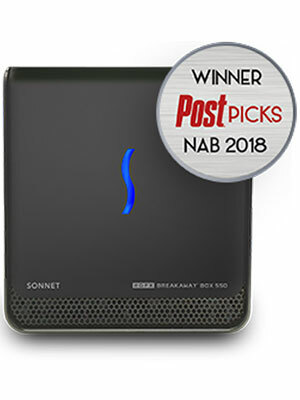 Griggs chose the AMD Radeon Pro WX 9100 graphics card in the Apple-recommended Sonnet eGFX Breakaway Box 650W, with the Sonnet connected to an AMD FreeSync1-enabled 4K display. The combination overcomes a “frustrating compromise” that Griggs had made for years — that of having to switch between his Apple MacBook Pro and higher-powered Windows-based workstations he custom-built. He said in his experience, the performance of After Effects and Premiere, both from Adobe, is enhanced by the powerful GPU, while his favorite editing application, Apple Final Cut Pro X, is “a beast” on the eGPU when scrubbing, rendering previews and working with effects and motion graphics. In his own tests, Griggs said the speed improvements when using the Radeon Pro WX 9100 eGPU with a MacBook Pro for Maxon Cinema 4D are also dramatic. For a Radeon ProRender scene he created, the Radeon Pro WX 9100 eGPU took 10 minutes and 8 seconds to render the scene compared to more than 42 minutes for the laptop’s internal Radeon Pro 560 integrated graphics. This is a benefit when working under tight deadlines. “With everything delivered digitally, if you’re on a one- or two-day turnaround and someone’s screaming at you, a half hour can make a difference,” he said. With a performance increase of up to 4x4, the Radeon Pro WX 9100 eGPU in tandem with the MacBook Pro also has a creative impact, according to Griggs.